Neil Aspin blasted his FC Halifax Town side’s defensive record after they lost their sixth game of the season 3-2 at Aldershot. The result leaves Halifax second-bottom in the National League with just one win from eight games, and the Town boss was again left frustrated at his team’s defensive frailties. Aspin said: “I sound like a broken record now but you just have to look at the goals against column, that speaks for itself and that’s why we’re down at the bottom. “We’ve had four away games and in three of them we’ve let in three goals. “Again today they were early goals and the game is over before it’s started and we’re not giving ourselves any platform to go on and win any games. “We’ve conceded first in every game. When you’re trying to get confidence it just drains away. “I’m not here to make excuses. We’ve mad a lot of changes but we’ve still got the goalkeeper and three defenders from last year. “I take responsibility for results but they’ve got to start taking responsibility. 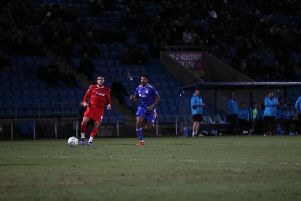 Aspin said the Town defence was culpable for all of Aldershot’s goals. “All three goals could have been avoided,” he said. “They also had chances in the second-half where they could have gone more than three ahead and that’s down to bad defending as well. The Town boss said his side shot themselves in the foot by leaving a mountain to climb, as they did in their previous away defeat at Wrexham, where they also conceded twice in the first 24 minutes. “Up until the first goal there was nothing in the game,” he reflected. “We weren’t threatening but we were comfortable and we’re the away team so you’d settle for that. “You need to then get past the 20 minute mark, get to 30 and go into half-time with a clean sheet. “Then in the second-half you’ve got a basis to try and do more going forward. “But at 2-0 down, the same at Wrexham, you’ve got a mountain to climb. “The only positive is we didn’t buckle, we kept going, kept trying to play. Aspin said the contribution of midfielder David Brooks was a major positive after the youngster notched his first senior goal to cap an impressive display. “He looks about 12 but the lad can play,” enthused Aspin. “He’s a good footballer. It doesn’t faze him. “Even if he gives the ball away he tries to win it back and I’m very pleased with his contribution.